The original Outlast quickly became a well-received horror title, as exploring the horrifying asylum with just a camera and your wit, led to an intense experience of survival. The sequel, Outlast 2, is very much in the same vein as the original Outlast, as players take control of a defenseless journalist who only has his trusty camera to guide him through the horrors that await him. What separates Outlast 2 from its predecessor is the more open design of the levels and the various themes that the game touches on. The game opens up with the journalistic duo, and husband and wife, Blake and Lynn Langermann, riding on a helicopter as they look into the death of a young pregnant woman. Things quickly fall apart as the helicopter crashes, leaving Blake to look for his wife and deal with the horrors that await him in the night. Blake eventually finds himself in the middle of a religious war, where crazy doesn’t even begin to explain those involved with it. If you’ve played Outlast, then you will be more than familiar with the controls and the overall gameplay of the game. Being stealthy and avoiding the people and creatures that want to kill you, and using the camera’s night vision capabilities, are a must in order to survive. There are many times though, where running is the only option and dashing away from whatever is hunting you becomes a frightful chase of survival. 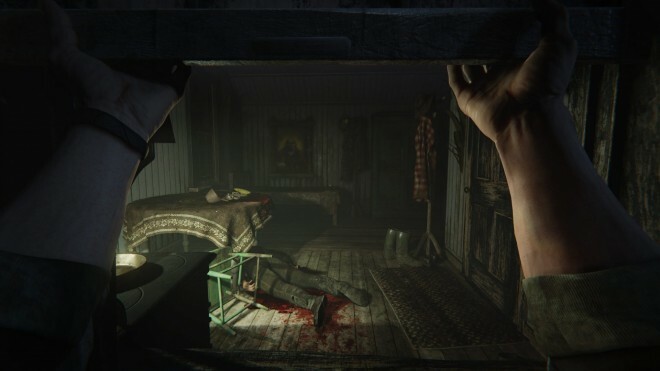 If you were hoping for a different approach to the first-person horror genre, Outlast 2 won’t offer that to you on the gameplay side, which at times can lead to many frustrating moments. However, if you’re looking for a solid horror experience with a story that is mostly intriguing, then you will be mostly satisfied. Horror filled story – Outlast 2’s story leaves a lot open for interpretation, but I still found it to be very interesting, albeit very dark. The story surrounding those involved with the religious war and the satanic cults was worth learning about. When I was struggling with the frustrating gameplay segments that occur throughout the first half of the game, the intrigue of where the story was going and what was happening to the people in the town was enough to keep me going. I will point out that the game is very heavy on religious themes and characters, mainly Christian themes. These themes play a key role in the plot as well. If you have any issue with overly religious aspects in games, then you might want to stay away from Outlast 2. By the end of Outlast 2, I had many questions about what had happened, but overall I found the plot and some of the characters involved to be compelling and worth seeing through until the end. Unsettling moments – Throughout my journey in Outlast 2 I witnessed a wide variety of actions and moments that left me uneasy or tense. 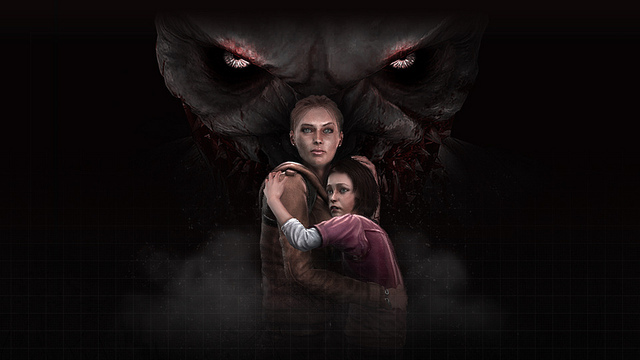 The game throws the book at you when it comes to horror tropes and situations, which isn’t necessarily bad, as I encountered certain moments that really were well-done even though it wasn’t the first time I had seen it in a game before. 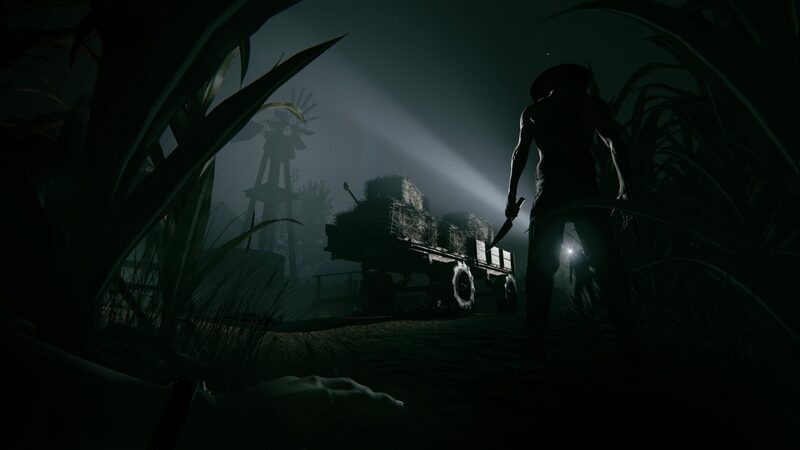 Outlast 2 will provide the occasional jump scare as well, along with the stress that comes with avoiding a brooding enemy ready to remove Blake’s “manhood” and send him to his grave. 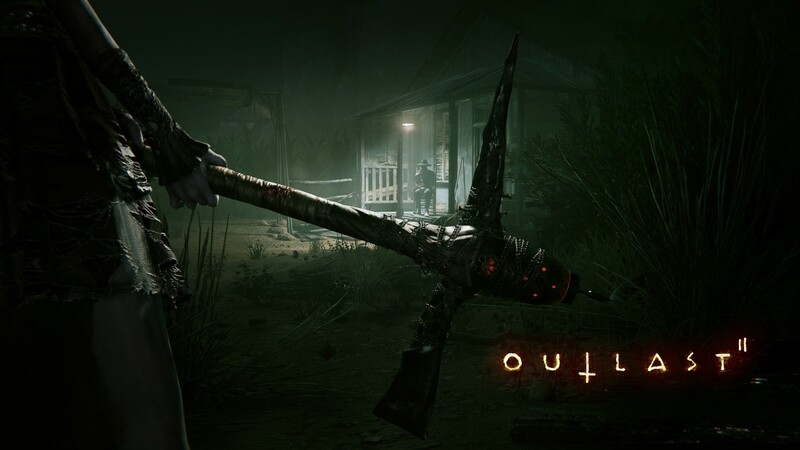 The psychological horror definitely plays a much bigger part in Outlast 2 than in the first game, and with that comes much less jump scare moments and more moments focused on messing with the player’s mind, which I appreciated. Run, hide, run, hide, repetitiveness – There was a point in the game, around the midway point, where I was really not enjoying the game all too much. Most of this was due to the repetitive nature of the early portions of the game. These early portions consisted of either hiding and sneaking past a bunch of crazy enemies or running away from a supernatural being who would kill me instantly if they caught up to me. The first time around, these moments were filled with tension and had me on edge, but after repeating the process over, and over again, they began to completely lose any sense of tension they were supposed to create. I found most of the early hours involving this repetitive design structure to be more frustrating than anything; luckily the game changes things up a little in the second half, which created a much more enjoyable experience. Trial by death – You will die a lot in Outlast 2. I knew beforehand that me dying was going to happen more than a few times, but I died way more than I was expecting. Much of this was due to numerous occasions of what I would say were “cheap deaths,” moments where the game threw the player into a situation without any guidance whatsoever and giving them no time to react to an enemy who quickly killed them. I also encountered a handful of moments in the game where I was completely lost on where I had to go, most of the time the solutions to this were barely visible bloody hand prints on a climbable surface or a hole under a wall that could be easily missed. The combination of these unforgiving moments, along with some questionable level design choices, had me staring at the loading screen for way more time than I wanted. Outlast 2 has some problems that left me frustrated for most of the first half of the game, as well as some questionable segments later in the game. Even with that said, it also offers a gripping story revolving around the main character and religion, that left much to be interpreted and theorized, yet kept me interested throughout the game. 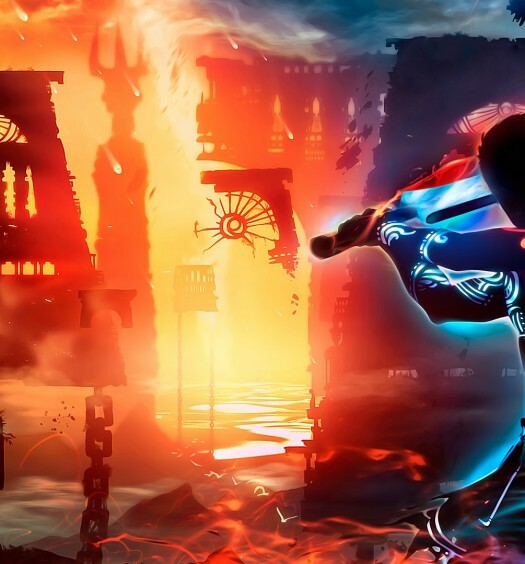 The gameplay won’t wow you, but it can offer some solid scares, and will definitely provide players with some disturbing scenery. If you enjoy the horror genre or liked the first Outlast, then you most likely will like Outlast 2. If not, then you may easily get frustrated or turned off by the experience. 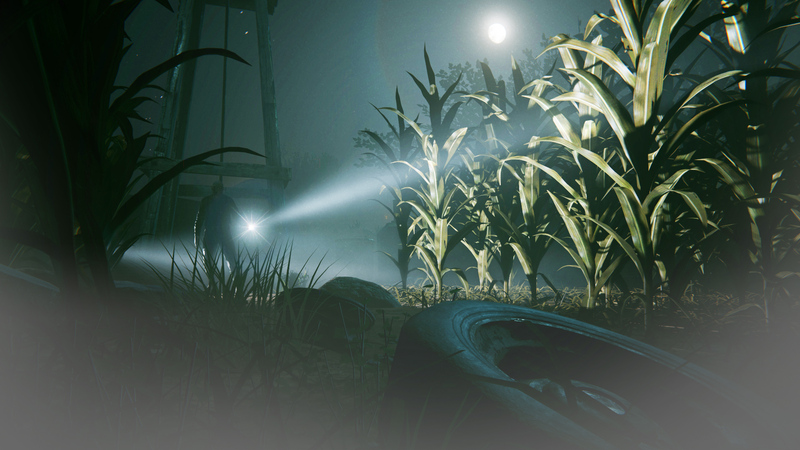 Outlast 2 was developed and published by Red Barrels Studio on Xbox One. The game released April 25, 2017, for $29.99. A copy was provided for review purposes. Derin is a 23 year old Journalist who loves to write about games. He also is a big sports fan and enjoys watching the occasional anime. You can see him talk about random topics on twitter @Derin_Loe. AMY too hard for most gamers?